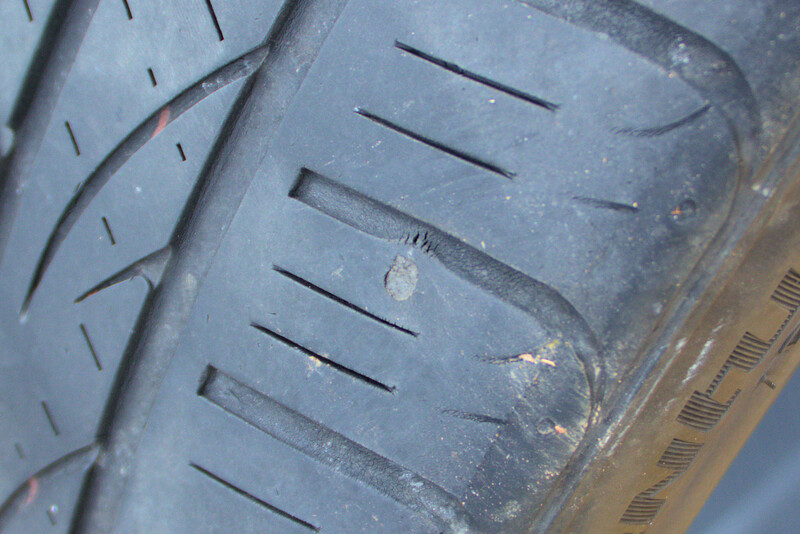 When my car was in for the APR Stage 2 upgrade, the mechanic noticed that the tread on one of my tires was separating. I had just starting hearing some noise that sounded a little like the tread wear bars pulsating against the pavement. There was enough tread on the tires to last until spring, but the tread separation sped my upgrade plan. It was probably a good thing that last week’s rain kept my newfound Stage 2 exploitation temptations in check. I had hoped to wait until I knew the freezing weather was behind us before mounting performance tires, but I needed something right away. I quickly upgraded to a set of Firestone Firehawk Indy 500’s. I hate the idea of tire shops mangling my pinch welds or over-torquing my lug bolts. So I mounted and balanced the tires myself at a nearby military auto/hobby shop. It was while balancing the wheels that I noticed two were bent. The bent wheels, both on the driver’s side of the car, were confirmation that I had apparently struck a pothole, bent the wheels slightly, and damaged the front tire. I had just used my “wheel money” to buy a new trailer, so I wasn’t in a great position to replace my wheels. I also wasn’t quite ready to switch from Nogaros, especially after my recent revelation. The auto/hobby shop manager told me about an excellent wheel repair technician with Alloy Wheel Repair Specialists. 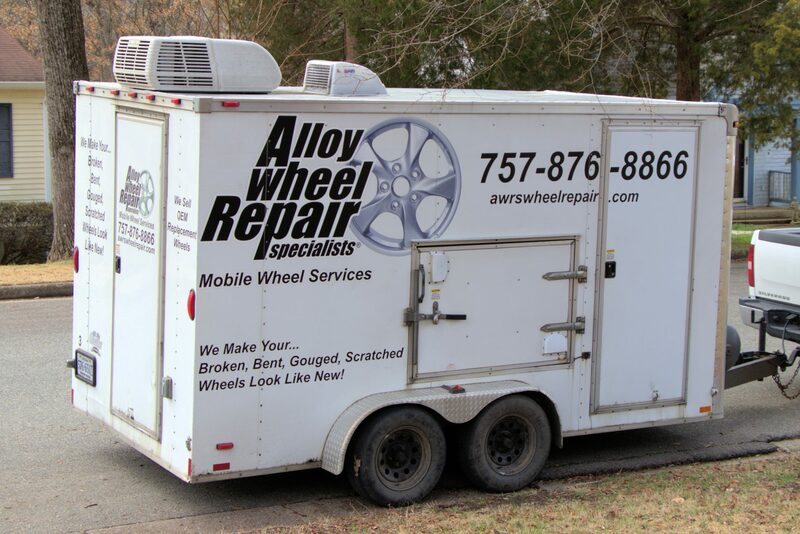 Apparently, their mobile repair techs can fix most damage and can even refinish painted alloy wheels. I called him and he came to my home the same day. The process he used to measure and straighten the wheels was precise and fascinating. My wheels were not bent enough to crack, but they were over 100/1000-inch out of true. 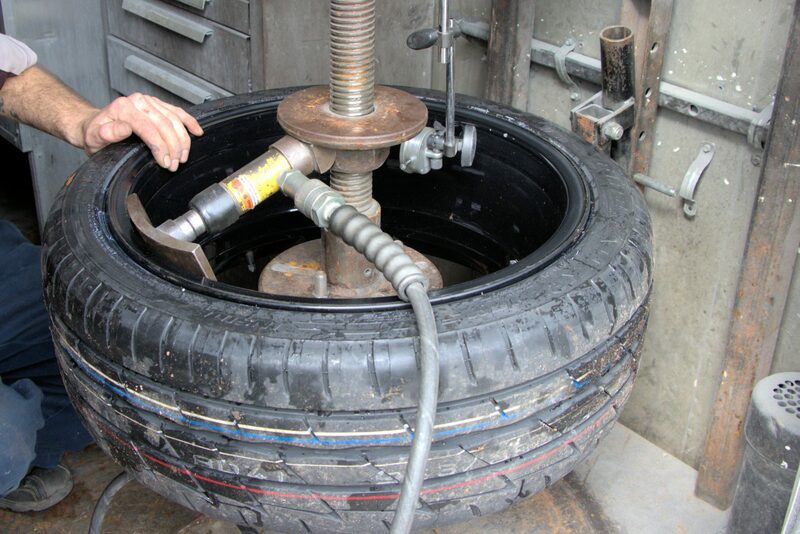 He used a hydraulic jack and a special rig to true the wheels within 15/1000″. He kindly checked my other wheels, verifying that they, too, where true within 15/1000″. I highly recommend AWRS for your wheel repair needs. Click here to see what they offer; click here to see if there’s an AWRS specialist near you. With my wheels freshly trued and rebalanced, I still had to practice some restraint wet roads. The pavement was dry within a few days and I was able to put the Firehawks to the test. The tires grip VERY well on twisty roads and exit ramps. Traction during acceleration and braking are greatly improved over the stock Hankook Ventus S1 Noble2. The Firehawks aren’t quite sticky enough to control the wheel-spin from nearly 400 lb-ft at the wheels, but I’ll accept them as a great compromise between traction and treadlife. Their grip may improve as the roads heat up this summer. I’ve noticed that the Firehawks are quiet, too. Falken’s Azenis RT-615K was my summer tire of choice on my Mk3. Their grip is fantastic, especially on wet roads, but they’re louder than all-season tires. They also last just 12,000-15,000 miles. The Firehawk may or may not grip as well as the RT-615K’s. I cannot be certain since the Mk3 and Mk7 are wildly different cars. But I’m confident that the Firehawks are quieter and will probably last longer, with an UTQG of 340 instead of 200. I look forward to seeing if their traction improves as the weather warms. It’s still between 45-70 degrees here. I suspect their traction will improve substantially when it’s in the 80’s or 90’s. Oh, I once mentioned that I would share photos of the plugs when I removed the tires. 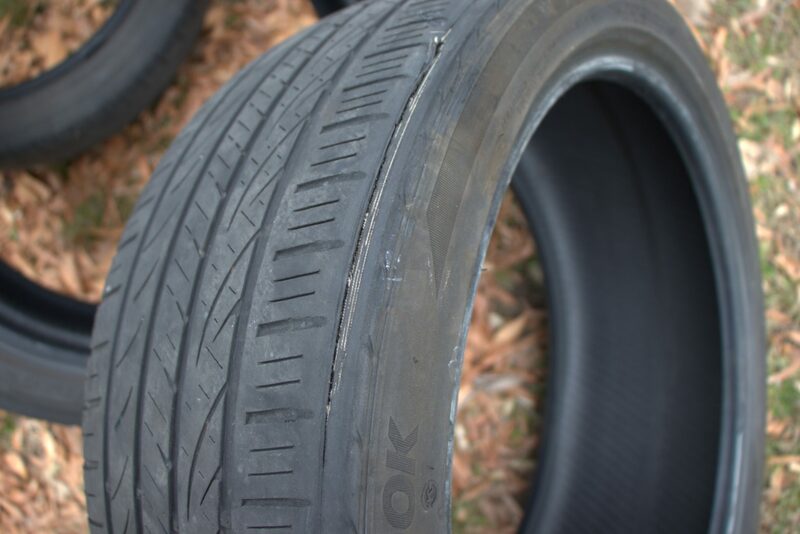 The plugged tires were on the passenger side, so they had nothing to do with the tread failure on the driver’s side. In short, the plugs still looked great after 15,000 miles. I had no reason to believe they would fail any time soon. One of the plugs is very close the sidewall and may have caused problems if I was an aggressive driver. But my GTI is mostly a commuter car and I’m fairly easy on its tires. I wouldn’t hesitate to use plugs again, especially if using them gets me out of a jam or saves me from having to replace fairly new tires. I’ve shared more plug photos below. Did your MPG drop with the stickier tires? How are they holding up. Considering changing mine but have heard reports of people switching to pilot super sports losing 4-5mpg. You could probably consider some lighter wheels — store the Nogaros for posterity (I’m considering it with mine) — and get your 2-3 mpg back and more. 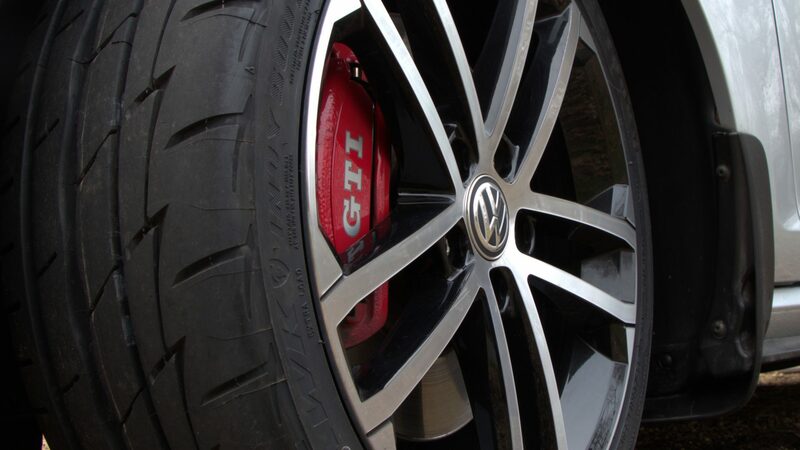 You will also reap handling and ride benefits from reducing the unsprung weight.